It's nice to see so many new tea companies popping up these days, many of which are focusing on high quality teas sourced directly from the farmers. Tea Ave, a company that just launched their website this month focuses on high quality Taiwanese oolongs. Our scented oolongs are prepared using the ancient method, which means the tea leaves absorb the flower fragrance during the baking process, producing a scented tea that’s aromatic and flavorful without using any additives or chemicals. I received a delightful promotional package which included an aroma cup set along with the samples. I decided to use this to taste the tea. I wasn't completely clear on how to use the set (do I brew the tea in the aroma cup like in a gaiwan and pour into the tasting cup? ), and I found this handy YouTube video. The tea is actually brewed in a separate vessel, so I'm glad I did some research first. Armed with this new information, I was ready to sample the tea. The dry leaves had a mellow soft rose scent along with sweet candy and a light green grassy finish. It conjured up visions of strolling through a rose garden on a sunny cloudless day. 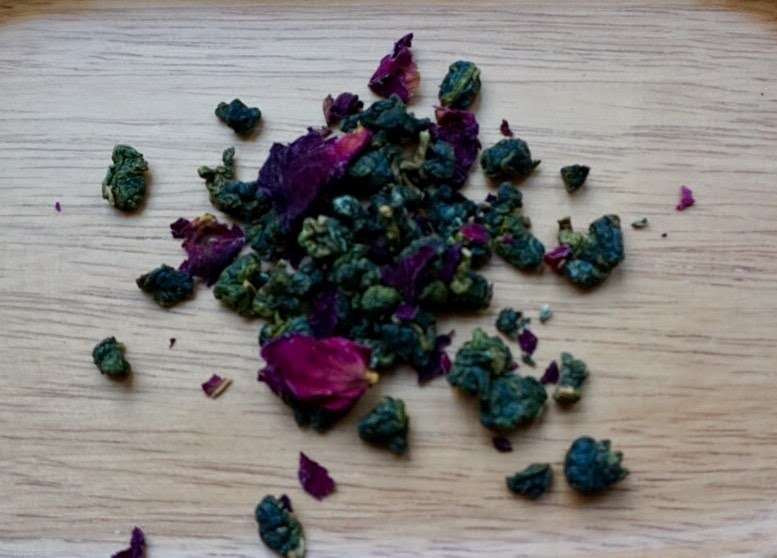 The first infusion was similar to the dry leaves but grassier and floral-- less specifically rose, more of a floral oolong aroma that I've become familiar with. The taste was buttery, sweet and creamy. I also kept picking up on a citrus note along with a rose/floral taste. It was soothing and delicate. I kept imagining fuzzy rose petals pressed up against my cheek. I did a second steeping which had the rose/floral and citrus components but with a strong woodsy note. It additionally had a honeydew melon element, and was less buttery. I think I liked the second steep more than the first, it was more complex. I've actually never been a huge fan of rose in food or beverages. I love it as a perfume, but I've never enjoyed eating it. I found it soothing in this oolong, and not overpowering. This may not be a tea I'd order for myself, but I can definitely appreciate it. I'd recommend it for those that enjoy a rose flavor. The promotional package I mentioned early sent by Tea Ave contained tea samples, the aroma cup set in an attractive box, a gift card, and a tote bag. Quite the package. I'm happy to report I have a duplicate package for a giveaway. I'll be posting the giveaway next week so stay tuned! I also have two more oolongs to review and I will be featuring an interview with the Tea Ave company founders. Thank you to Tea Ave for the package. I have had rose flavored tea before and found it enjoyable, but I've never had oolong before. Based on your review, it sounds like something I might like. Thank you for your review and I look forward to reading your opinion of the other flavors!